Home workout to burn stomach fat. Do you aim to lose excess fat on your belly? In this article, we will discuss five of the most effective home workouts to burn stomach fat exercises you can try at home. Vanity isn’t the only reason it is a good idea to blast that tummy fat. According to the journal Heart, fat in your belly can put you at a greater risk for sudden cardiac death, hypertension, high cholesterol, and diabetes. Moreover, the book “The Belly Fat Cure” cited a Pennsylvania State University study which indicates that tummy fat is associated with higher levels of exhaustion and sleepiness during the day. Lie down with your arms positioned at your sides. Place your heels and calves on the fit ball, making sure that they are about knee-width apart. Make your abs firm while raising the fit ball off the ground through your heels and thighs. Get back to your starting position slowly. Balance your body on the fit ball while facing down, in such a way that the only body parts touching the ground are your feet. Position both of your hands on your lower back and then lift your spine slowly off the fit ball but be careful not to overextend it. Return to the starting position slowly. 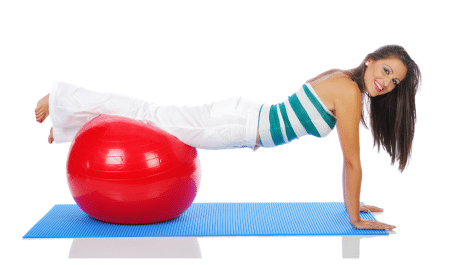 Rolling like a ball is indeed one of the top home workout to burn stomach fat for both male and female. Sit on the floor while bending your knees and holding your ankles. Next, roll backwards still holding your ankles and bringing your knees with you. Inhale as you do this and then exhale as you move forward. Every time you move forward, balance on your tailbone for half a minute while making sure that your feet don’t touch the floor. Lie down with your hands beneath your head and your knees bent. Curl your legs towards your ribs while at the same time lifting your shoulders off the floor. Return to your starting position slowly. Lie face down on the floor with your elbows bent near your waist. Lift your whole body and assume a plank position, wherein your body is straight and parallel to the ground, resting just on your toes and forearms. Hold this position by using your back and abdominal muscles. Get back to the starting position slowly. Aside from this five-home workout to burn stomach fat exercises, it is also highly important to ensure that you maintain a healthy and balanced diet. By minimizing your intake of sugar, salt, and fat, coupled with daily exercise. Do these regularly, and you will surely be able to achieve a flat tummy in no time.